When configuring an Exchange 2010 hybrid environment a Receive Connector is created on the Exchange 2010 server. This Receive Connector is configured with the FQDN entered in the Hybrid Configuration Wizard (see previous blog post on Exchange 2010 Hybrid) and the source IP addresses of the Microsoft Exchange Online servers. 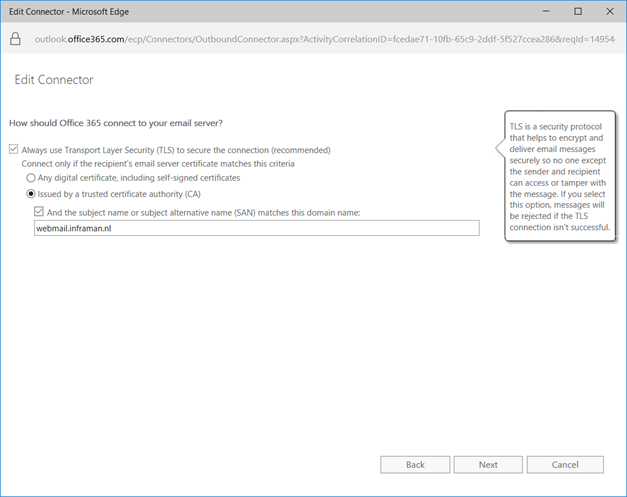 If one of these servers access the Exchange 2010 environment, they end up on the Office 365 Receive Connector (based on the IP address) and the correct SSL certificate is returned. This way mutual TLS is established between Exchange 2010 on-premises and Exchange Online. It sometimes happens that the wrong certificate is used for SMTP communication between Exchange on-premises and Exchange Online, thus resulting in SMTP mail flow failure between the two. You can check this in the Exchange Admin Center (EAC) in Exchange Online. Logon to the EAC in Exchange Online, select Mail Flow and click the Connectors tab. You’ll see two connectors. One connector for mail from Exchange 2010 to Exchange Online, and one connector for mail from Exchange Online to Exchange 2010. In my previous blogpost, I’ve discussed the prerequisites for moving from Exchange 2010 to Office 365 when using Directory Synchronization (using Azure AD Connect). 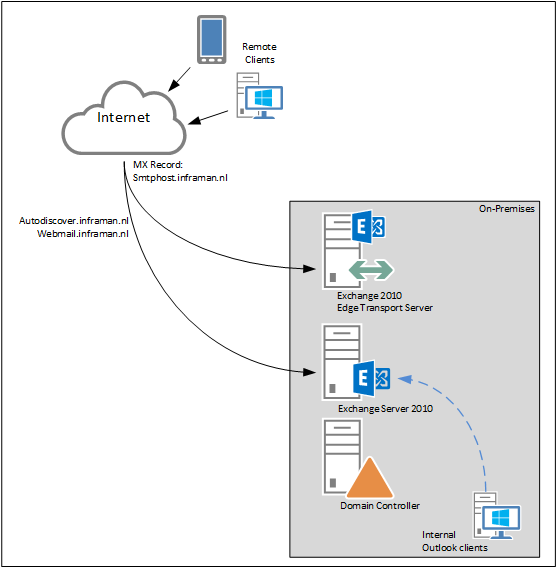 In this blogpost I’ll discuss how to create an Exchange 2010 hybrid environment. 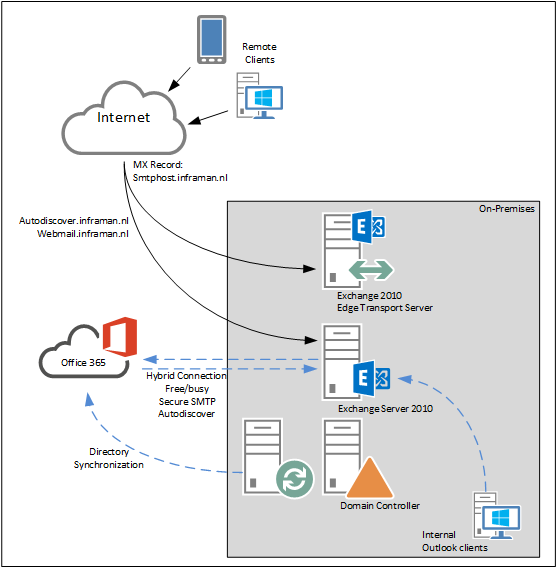 Now that Directory Synchronization is in place using Azure AD Connect we can focus on connecting the on-premises Exchange environment to Exchange Online, this a called an Exchange Hybrid Configuration. Hybrid configurations can consist of Exchange 2010, Exchange 2013 or Exchange 2016 or a combination of versions, so it is possible to have an Exchange 2010 and Exchange 2013 coexistence scenario on-premises, and connect this to Exchange Online. However, when using multiple versions of Exchange in a Hybrid configuration there’s always add complexity, and when configured incorrectly you can get unexpected results. Therefore, I typically recommend using only one version, so if you’re running Exchange 2010 on-premises, there’s no need to add an Exchange 2013 or Exchange 2016 server to your configuration, just as a ‘hybrid server’. Despite what other people tell you, there’s no need to add a newer version, and Exchange 2010 Hybrid is fully supported by Microsoft. Better is to create an Exchange 2010 hybrid environment, and when the mailboxes (or most the mailboxes) are moved to Office 365 upgrade your existing Exchange 2010 environment to Exchange 2016. But that might be an interesting topic for a future blog post . Figure 14. Exchange 2010 hybrid configuration. 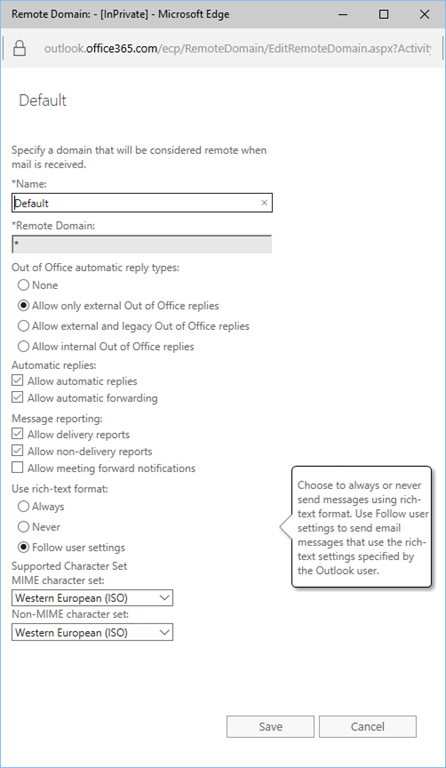 By default automatic forwarding and automatic replies of email messages is turned on in Exchange Online (Office 365). You can turn this of in the Exchange Admin Center of Exchange Online (https://outlook.office.com/ecp). 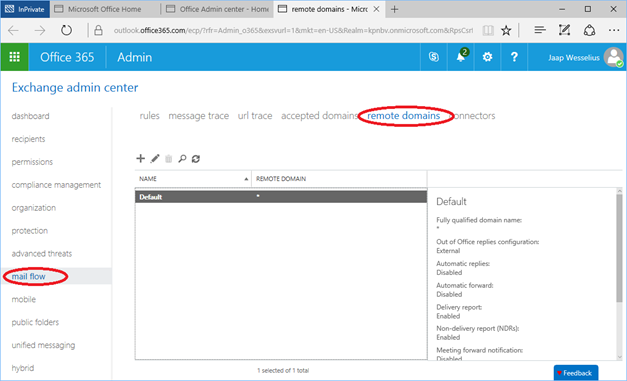 Logon using your tenant administrator, select mail flow in the navigation menu and select the remote domains tab. Open the Default remote domain and deselect the Allow automatic replies and Allow automatic forwarding checkboxes under Automatic replies. When you click Save automatic forwarding and automatic replies will be turned off in your Office 365 tenant. Please be aware that it can take some time before the settings becomes active (I think due to replication issue). The IT/Dev Connections 2017 takes place in San Francisco from October 23-26. IT/Dev Connections is a highly technical and non blahblah event, delivered by professionals for professionals. To give you an idea, this is the only event (I think) that has no keynote sessions, just a small talk 5 minutes before the welcome drink on the first day of the event. Data platform & business intelligence. Enterprise Management, Mobility and Security. If you’d like to join me and other already confirmed speakers like Bert Wolters and Sander Berkouwer, use the following link to register! The last 15 editions the event took place in Las Vegas, this is the first time it is NOT in Las Vegas but in San Francisco, in the Hilton San Francisco Union Square. Want to know more? Any ideas or feedback? Just leave a comment below or drop me an email. I’m looking forward to see you all again in San Francisco!